Ultrapure deionized water is commonly used in the healthcare industry to manufacture products such as eye drops, nose spray and hygiene products. This highly purified water, sometimes referred to as “WFI” (Water for Injection) or compendial water, presents many challenges for a flowmeter. WFI is non-conductive, corrosive to certain metals in nature and requires a sanitary style flowmeter. 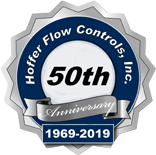 The Hoffer Sanitary Series flow metering products meets the requirements and is used routinely throughout the industry with excellent results. The BPE compliant sanitary design, 316 stainless steel construction and wide turn-down make the Sanitary Series an excellent solution for a WFI application. Pharmaceutical industry standards require that all flow measurement and other process devices must be fully “CIPable”, or suitable for “Clean in Place”. This means that the flowmeter must be fully cleaned when it is flushed with a suitable cleaning product or steam. 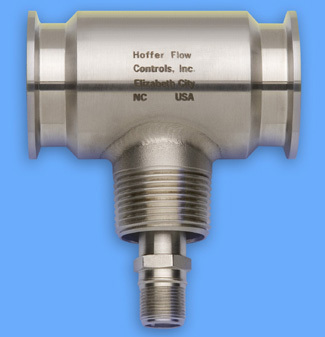 The Hoffer Sanitary Series of turbine flowmeters incorporates a design that is fully cleaned when flushed. Furthermore, this series of flowmeters is available with a hard carbon composite sleeve bearing that is suitable for steam cleaning. One Hoffer customer, an international manufacturer of healthcare products who employs 54,000 people, looking for a solution to a problem came to Hoffer to discuss a WFI application. The flowmeters then used in their WFI process were routinely being replaced. The cast internal assembly with a Rulon sleeve bearing was deteriorating after a few (CIP) cycles. The down time, replacement cost, and potential contamination from a deteriorated set of internals required immediate attention and a quick resolution from their maintenance personnel. The customer determined that the Hoffer Sanitary Series turbine flowmeter was the most accurate and cost effective solution for the application. The Sanitary Series provides flow measurement capability from .35 to 650 GPM in flowmeter sizes ranging from 1/4″ through 3″. The Sanitary turbine flowmeter provides turndown range of 10:1 to 40:1 depending on flowmeter size. A clamp type sanitary process connection is standard and the meter is fully “CIP-able”. Construction consists of 316/316L dual rated stainless steel body and hangers, 17-4 ph stainless steel rotor, and a carbon composite sleeve bearing. Hoffer is pleased to provide sanitary flowmeters for the healthcare industry. If your facility uses deionized, demineralized or WFI water contact us to help with your flow measurement needs. Let our 45 years of experience in flow measurement become your resource.